734 Cima Vista Point, Colorado Springs, CO 80916 (#7267205) :: Fisk Team, RE/MAX Properties, Inc. This exceptional open concept ranch style condo/town-home boasts over 2100 square feet, 4 bedrooms, 3 bathrooms & an attached 2 car garage with remote. Lengthy driveway for guest/friends to park. Impressive exterior stucco-serving up first class elegance. NEWER AMENITIES; stainless steel appliances: side by side refrigerator w/ice maker & water/ice dispenser, 5 burner flat top stove w/self cleaning oven, over the range microwave, dishwasher, upgraded kitchen faucet, upgraded ceiling fans in the living room & master bdrm, upgraded lighting through out & upgraded window blinds. Ease w/unloading groceries from the car-kitch access from the attached 2 car garage. Main level bestows a 3/4 guest bath for convenience & also adjoins the 2nd bedroom, formal living room w/3 sided gas fireplace & a walk out to the rear, recently painted wood deck. Formal dining rm shares the 3 sided gas fireplace. Main level provides 2 spacious bedrooms including a mstr bdrm w/a walk in closet & adjoining private 4 pc mstr bath; double vanity, ceramic tile surround tub/shower, linen closet & medicine cabinet. Expansive fm rm located on the lower level along with a 2 more bdrms/study/office, extra large storage rm, laundry space & lge full bthrm. Considerable common yard areas throughout the community for children & pets to play. Maintenance free gated community supplies great amenities; water, sewer, trash removal, exterior maintenance, insurance, management & landscape maintenance. 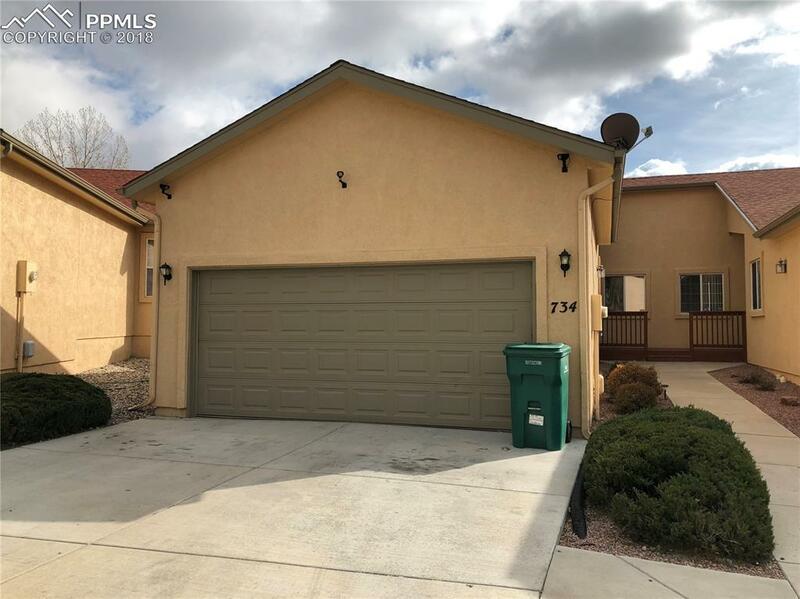 Conveniently located w/easy access to I-25, within min of Fort Carson & Peterson Air Force Base, quick access to Academy Blvd, Powers Corridor, hopping & restaurants, fabulous parks & playgrounds. Colorado living at its best! This one won't last long-don't miss out-view it today! SOLD AS IS but in great condition! Listing provided courtesy of Absolute Realty Inc.